(REUTERS / James Lawler Duggan)Stephanie Ragusky of Loudoun County, Virginia demonstrates outside the U.S. Supreme Court as it hears arguments in the case of Town of Greece, NY v. Galloway, in Washington November 6, 2013. The Supreme Court today heard the case concerning public prayers before town meetings and whether it violates the Constitution. 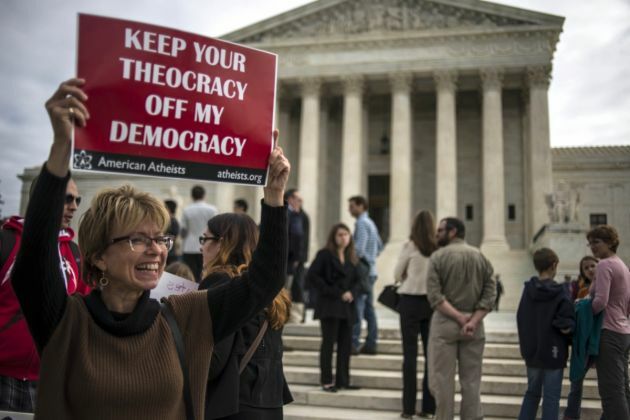 WASHINGTON, May 5 (Reuters) - The U.S. Supreme Court ruled on Monday that a town in New York state did not violate the U.S. Constitution's ban on government endorsement of religion by allowing prayers before its monthly meetings. In a decision that is likely to guide how local governments throughout the United States handle the question, the court said on a 5-4 vote that officials in the town of Greece did not violate the law when picking prayer-givers, who were overwhelmingly Christian. Even the plaintiffs challenging the practice in Greece, a Rochester, New York, suburb of 100,000 people, conceded that some types of nonsectarian prayers are permitted under the Constitution. The difficulty facing the justices was how to decide how courts should consider when a prayer could violate the First Amendment calling for separation of church and state. The court was divided along ideological lines, with the conservative wing of the court saying the prayers were acceptable, while the liberal justices said the practice violated the First Amendment. "To hold that invocations must be nonsectarian would force the legislatures that sponsor prayers and the courts that are asked to decide these cases to act as supervisors and censors of religious speech," Kennedy wrote.